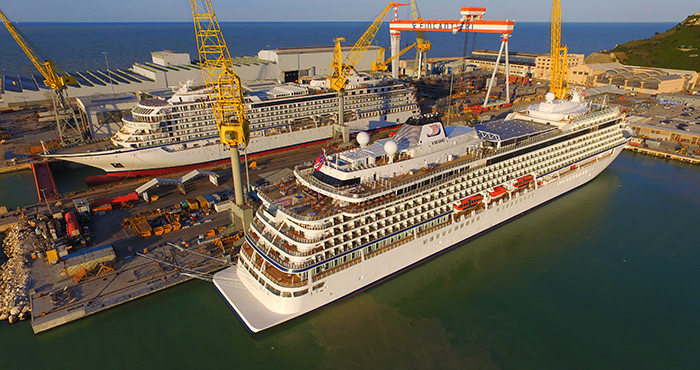 Viking Sky, the third of six cruise ships Viking Ocean Cruises has ordered from Fincantieri, has been delivered today at the shipyard in Ancona. Viking Sky, as its sister ships, is placed in the small cruise ship segment. In fact, with a gross tonnage of about 47,800 tons, it has 465 cabins with accommodation for 930 passengers, with a total capacity of over 1,400 people, including the crew. The ship has been designed by experienced naval architects and engineers, including an interior design team of London-based SMC Design, and Los Angeles-based Rottet Studios, who transferred on Viking Sky a modern design of Scandinavian inspiration, featuring sophisticated elegance but functional, at the mean time. In addition to the all-veranda staterooms, the ship also has spacious suites with sweeping views, two pools, of which one Infinity Pool off the stern, and a Spa designed according to the wellness philosophy of the Scandinavian tradition, with a sauna and a snow grotto. The Viking Ocean Cruises units are all built according to the latest navigation regulations and equipped with the most modern safety systems, including the “Safe return to port”. Furthermore, they feature the most advanced technologies for energy saving and for meeting the strictest environmental regulations with energy-efficient engines and an exhaust gas cleaning system. The first of the series, Viking Star, has been built at the shipyard in Marghera and delivered in spring 2015, the second, Viking Sea, took the sea from the shipyard in Ancona at the beginning of 2016, while Viking Sun, the fourth unit launched in the same yard a month ago, will enter into service in autumn 2017. The last two units will instead be delivered respectively in 2018 and 2019.